Struggles are real. We have to overcome them before they consume us and hinder us from achieving our career goals. 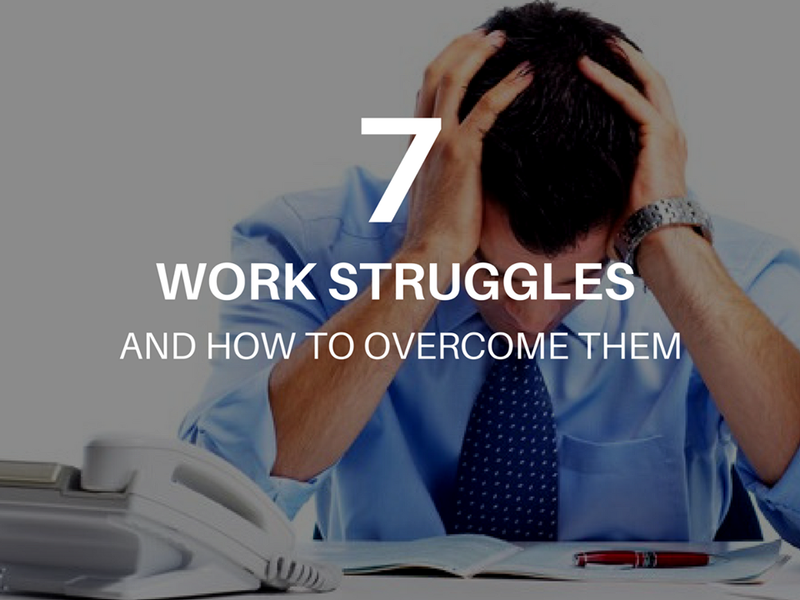 Here are 7 common work struggles and some actionable tips to overcome them. 1. LOOKING AT OTHERS’ STRENGTHS AND GOOD SIDES. You remain professional at all times despite your boss not treating you well. This is a struggle of either giving in to your emotions or managing it well and not taking it personally so you can focus at work. This, at some point, is something you won’t be able to address by yourself. The boss or your officemate is the one who can change their attitudes towards work. It’s a battle of managing your emotions well so you don’t get affected by hearsay and negative opinions about the company/job. 2. BEING HUMBLE YET CONFIDENT OF ABILITIES. 3. RUNNING OUT OF MONEY, TWO DAYS AFTER YOUR 1ST CUT OFF. It’s been two days since you received your 1st cut off salary, but you are now running out of money. There’s no other way to overcome this struggle but to allocate money for savings first before spending on needs and wants. If you still lack even you’re only spending enough for your needs, you might as well look for a part-time job or strive more at work so you’ll have a higher chance of getting promoted and having a salary increase. 4. MOTIVATING YOURSELF WHEN YOUR WORKPLACE LEADERS DON’T MOTIVATE YOU. If your motivation isn’t strong enough, you can either be mediocre and just settle for less or decide to quit your job as early as now. Given that we have extrinsic motivation that you’d get from your colleagues and bosses, if you are not getting the right motivation from them, it might add up to your discouragement and stress. Always seek motivation and strength from God, from your family, and from the work itself – if your job is something you really love to do. Don’t quit your job too early or you might regret later on. It’s very important to seek motivation at work, good enough to push yourself through your limits and overcome work challenges. 5. DOING YOUR BEST BUT LACK RESOURCES IN YOUR OFFICE. You did your best but it wasn’t enough to produce the required daily output at work– not because you’re unproductive, but because you lack in resources. There is a need for the company to hire new people to help you out, add facilities and office equipment, or improve your current technology to ensure you’ll be able to complete tasks effectively. Raising this concern to high-ups should be your first action. This isn’t the most effective at times, but letting your bosses know about issues will alarm them to eventually hire for new people for the team. The company would still decide if these issues will be resolved immediately. 6. BEING POSITIVE IN A NEGATIVE WORK ENVIRONMENT. If most of your colleagues are talking against the company, their bosses, and other teammates but still stay in the office, this might be your struggle as a professional – being positive despite the negative work environment. Given that, listen to your colleagues with empathy. Show that you care for them. Remember that hurt people hurt people and this might be the case for them, if they only complain once or twice. But if these things occur often, be constructive in your correction . Use the two punch approach: positive and negative. Some might find this as a constructive feedback towards their behaviour. If you’re not confrontational in this matter, just don’t let yourself be affected with their negative words. Thriving in this work environment and staying focused towards your daily goals is very important. 7. BRINGING WORK AT HOME. Audit your work week. Track your time by 30 or 60-minute intervals to see if there are constant interruptions at work (surfing the net, attending meetings that provides no value, email interruptions, etc..). Check if you have unproductive activities that you can instead spend solely for work tasks. See if your colleagues are also bringing work at home and this is a norm to everyone. If it’s not something you can’t take anymore, quitting your job is an option. If not, something is wrong with your job responsibilities or your ability to complete tasks. Review your job description and check if what listed there are the duties you’re still doing today. Perhaps, you might be doing tasks other colleagues should have taken care of. To those employee who are tired sometimes in their work and workplace!